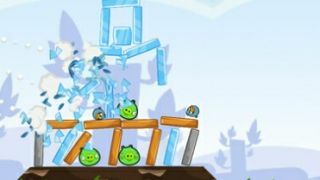 Just when you started to think that the Angry Birds craze may be winding down, Rovio has announced that more people played the game in December than ever before. The Finnish developer said that 263 million people had played its titles, across all platforms (including on PC and Mac) during the festive month, smashing the company's previous record. And, although Rovio didn't mention Angry Birds specifically, it's not like millions upon millions of people were tucking into Amazing Alex on Christmas Day. The surge in downloads is likely due to the amount of folks who received their first iPad, Kindle Fire or Google Nexus 7 tablet for Christmas and fired up Angry Birds as their first port of call. The company had already announced that 30m new downloads of its games occurred over Christmas, adding to its phenomenal billion-plus downloads. It seems, with a 3D animated movie set for 2016, Angry Birds theme parks and a potential IPO on the way, those Angry Birds aren't ready to migrate to pastures new for a good while yet.